After listening to Semi Precious Weapon’s sophomore release, You Love You, you kind of want to take a bath to escape all of the glamour, grime, and grit that is just pouring out of the release. Everything associated with this short, nine song set, make you feel just a little bit dirty inside and out, and that’s really the hook and motive of SPW, akin to their former opening, and now headlining tour make Lady Gaga, it’s all about t the show and marketing, and a little less about the music. There are definite standouts on this release, but the jerky flow starts with an explosion to your face in the self-titled first track and things slowly taper off into solemn ballads including the “Leave Your Pretty To Me.”; The problem here is, it all feels like a show band, there’s no substance to it, even from music school grads you don’t expect them to get it 100% correct the first or second time out of the game, but channeling Jane’s Addiction will only get you so far. 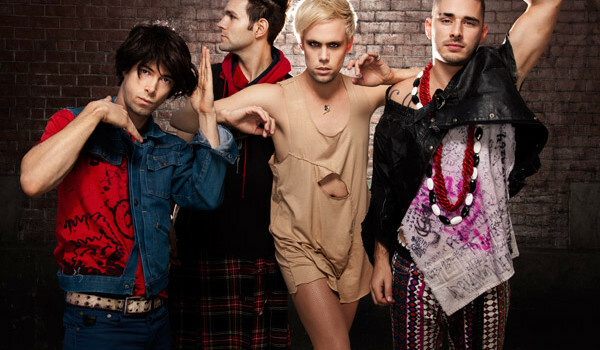 There are some truly unlistenable tracks on You Love You including the hook-less, and aforementioned title track “Semi Precious Weapons“; and the annoying “Put a Diamond In It“;. One time through the album is about all you’ll need to clear up any lingering doubts about the band’s status in your rotation. Maybe the glitz and glamour, eff-the-world, this is rock-n-roll sub-genre is dying just as fast as it came into the industry, but there just doesn’t seem to be a place to fit Semi Precious Weapons into the current landscape, which is probably what they’re going for, to be unique, however there just seems to be some real problems with their act that instantly turns listeners off when you can see the zipper on the rubber suit.